Automation is one of the key capabilities supporting this transformation. From a business standpoint, eliminating the need for manual (i.e., human) intervention in complex or repetitive business processes can have a positive impact on operations. By automating certain decisions, organizations can not only accelerate process workflows but also improve the accuracy and consistency of the results. The concept of business automation is not new, but the technologies continue to evolve to meet changing business demands. Ultimately, the value of these technologies can manifest itself as an increase in agility, e.g., operational efficiency, time-to-market, or market and customer demand; a more responsive and personalized customer experience; and lower costs. In August 2017, we polled a selection of Red Hat customers to learn more about their motivations for adopting business automation technologies and how they are using them, as well as the role these technologies play in respondents' digital transformation initiatives. Based on the results of this survey, respondents appear to have a firm grasp of the benefits offered by business automation, although they identified a broad range of priorities driving their adoption of this technology. When asked about their primary motivation, 34 percent indicated that their organization has adopted business process management (BPM) technology—one of the core capabilities of business automation—to improve operational efficiency. Another 24 percent identified the need to improve customer experience, and 15 percent said they are seeking to lower the cost of operational processes. To accomplish these goals, respondents are applying this technology within their organization as a means of automating internal processes (57 percent); supporting new applications (46 percent); automating external processes, e.g., processes that touch customers, partners or suppliers, (41 percent); and supporting self-service applications (29 percent). While BPM is one of the core capabilities of business automation, it is often deployed alongside other technologies that either enable or extend it, such as integration (deployed by 57 percent of respondents) or containers (55 percent), or have been designed to provide a more specific automation function. Technologies in this second group that are being deployed by respondents include mature capabilities such as business rules engines (61 percent), mobile application platforms (29 percent) and case management (27 percent), as well as more nascent capabilities such as low-code application development (24 percent), artificial intelligence and machine learning (20 percent), and robotic process automation (10 percent). 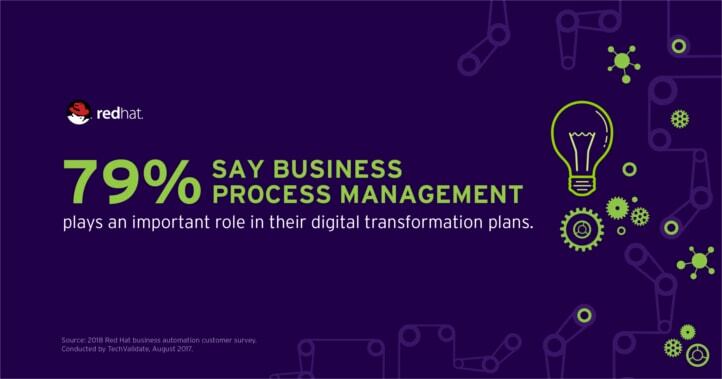 Together, these technologies are being used to support the automation efforts driving digital transformation for the majority of respondents, with 79 percent emphasizing that BPM plays an important role in their digital transformation plans.